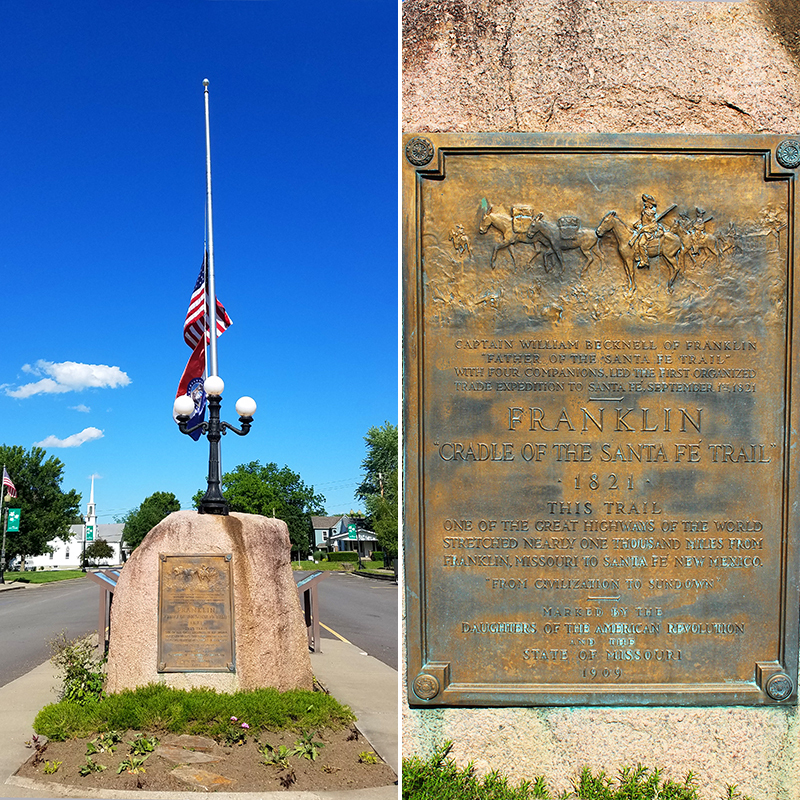 Our previous article started at the Trail’s Head in Franklin, Missouri where it all began. There are numerous historic sites in this area and we suggest that you check the Official Santa Fe Trail Association and the Santa Fe Trail Research Site for nearby places, museums, visitor centers and historical societies that may interest you. 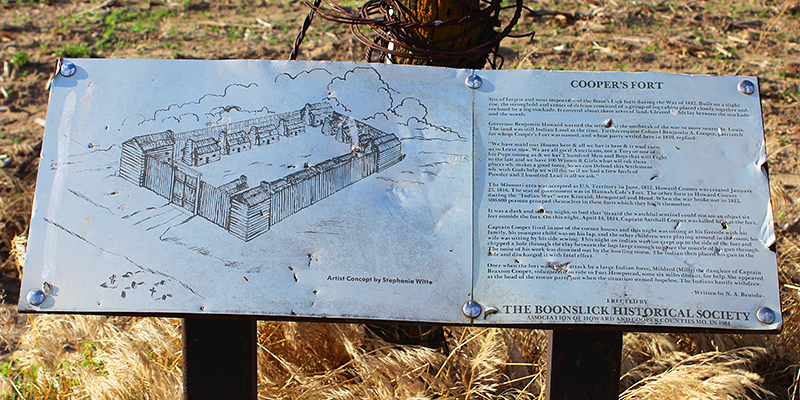 Three places in close proximity to the trail’s beginning are Cooper’s Fort, the Boone’s Lick State Historic Site, and the town of New Franklin. When you stand at the flagpole at the beginning of the trail, you are on The Spot where it all began. As you leave the parking area of markers and drive west on MO 87 to Route Z, you are officially traveling the very first leg of the SFT, as seen in the video below. All along the trail you will find granite markers that were placed by the Daughter’s of the American Revolution (DAR) to preserve the history of the trail and let people know they are indeed following the original route. Cooper’s Fort once stood in this field. It was built by Benjamin and Sarshall Cooper to protect settlers during the War of 1812, was a fortress that housed about 20 families in log cabins, and washed away in the flood of 1844. As we stood looking out to the field, it was a warm summer afternoon and the landowners happened to drive by in their golf cart. They told us about their grandfather who told stories of taking the Arrow Rock ferry ride back and forth as a child growing up on the farm. 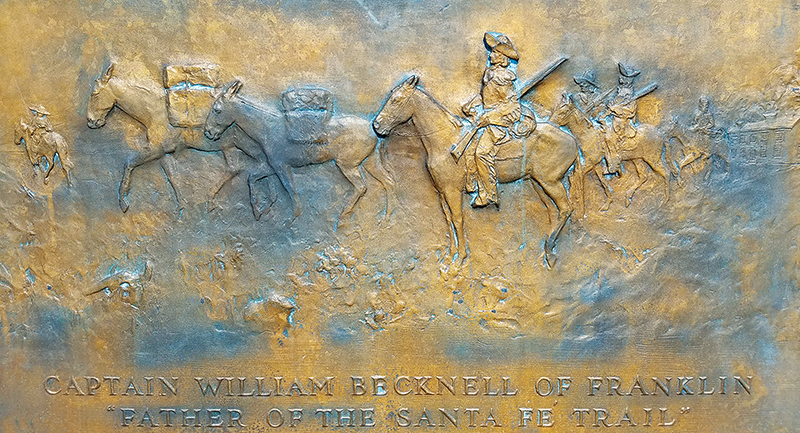 Father of the Santa Fe Trail, Becknell, ran the ferry for a time. It is no longer in operation and there is no outlet on this road. To reach Arrow Rock (and the ferry landing) it is necessary to to back track through Boonville, to I-70, then west to the Arrow Rock exit where you will find a village that seems unchanged since the early 1800s, complete with the J. Huston Tavern that was the super store of it’s day. But before heading there, the saltworks that the Daniel Boone brothers and Becknell once owned are very close by. 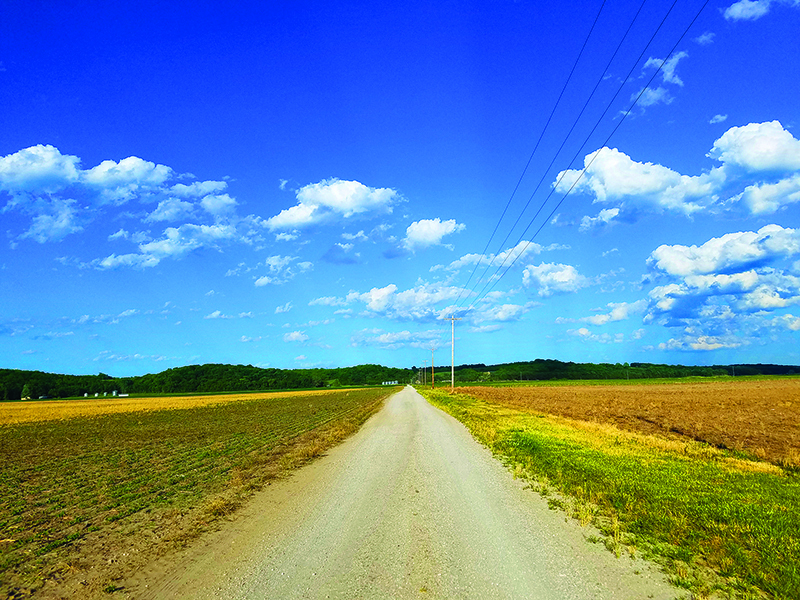 A short drive heading west from the Old Franklin flagpole on MO 87, take a left onto Road Z driving towards Petersburg, and then a final left onto Gravel road 330, leading onto private property farmland. 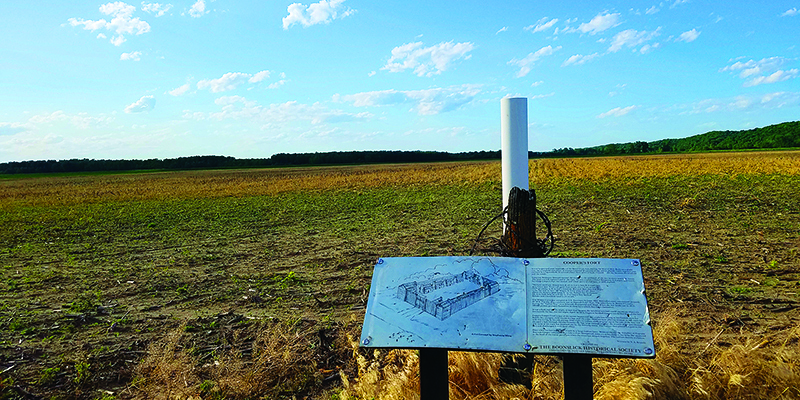 Less than a quarter mile you will find a Santa Fe Trail stone marker on the left side of the road, and a metal information panel on the right side indicating that Captain Benjamin Cooper’s Fort once stood on this land. Note: This road is accessible weather permitting. Located northeast of the Cooper’s Fort site. Named after the sons of Daniel Boone, remnants of the saltworks from this saltwater spring are still there to be viewed. The saltwater was boiled to crystalize the salt and then shipped to St. Louis, hence the reason for naming the county Saline. A very lucrative business, managed and eventually purchased by BecknelL, this is an important place in Missouri’s history of industry. There is a picnic area, and most of the walk down to the saltworks is in a heavily tree shaded area — a cool spot on a hot summer’s day. Many people in this area remember taking school field trips here. 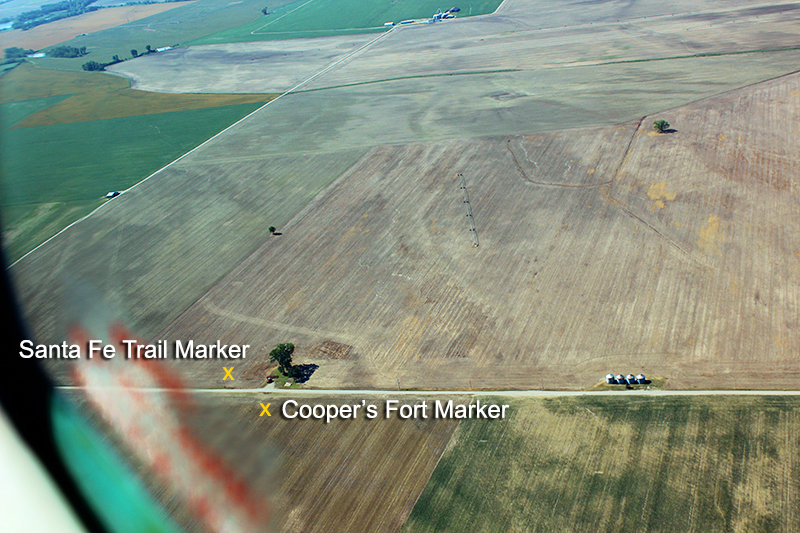 From the Cooper’s Fort site, drive back to Route Z and take a left heading north. The road will become County Road 328. 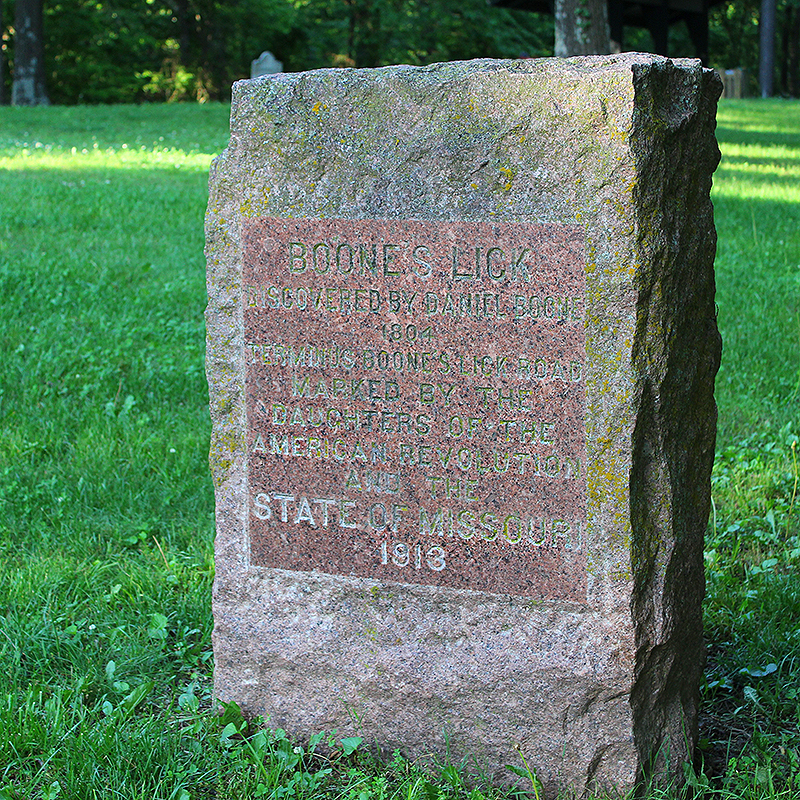 One mile, veer right bringing you to the entrance of Boone’s Lick site where the road becomes MO 187. Follow the signage. When Old Franklin washed away in severe flooding, New Franklin was established in 1828. In the center of town on Broadway you will find the Beginning of the Trail monument. This large boulder known locally as “The Rock” with a plaque was placed in 1909 by the DAR. 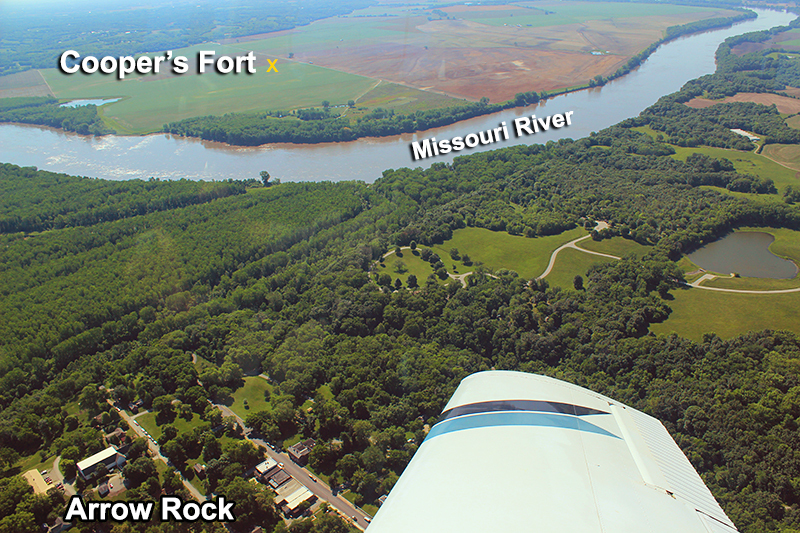 Here on higher ground the town and this monument are safe from the mighty Missouri River. 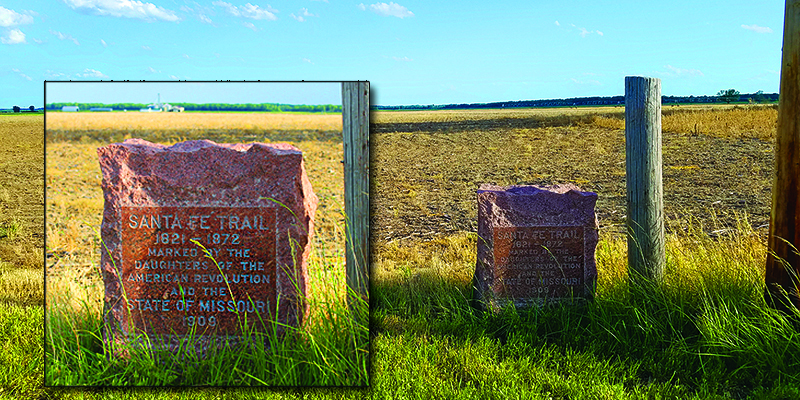 Another monument to the trail is located in New Franklin, with stone etchings of William Becknell, George Caleb Bingham, Kit Carson, Mildred Brown, Josiah Gregg and Ezekial Williams who traveled the trail. 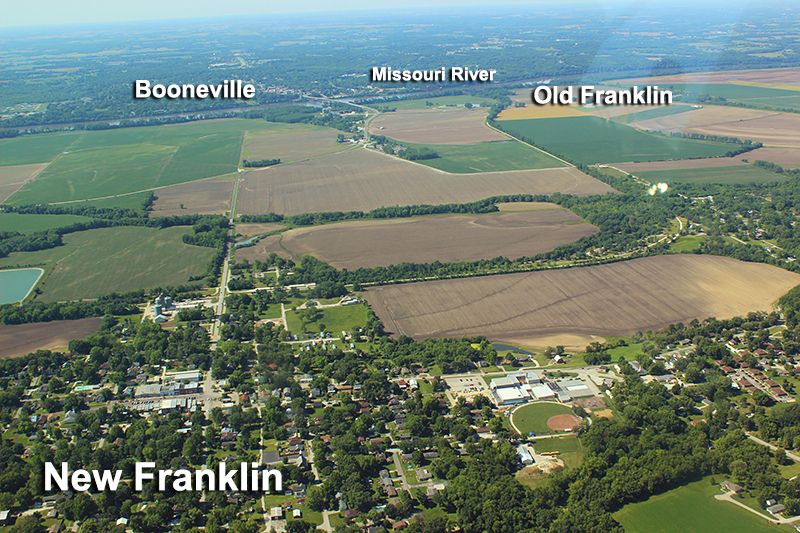 Here is the New Franklin History page with more sites to find in the area. Note: more on Kit Carson coming soon. As you travel the trail, depending on who you talk with, he is one of the most revered and at the same time despised legends of the Old West. The end of the trail is in Santa Fe, and the Carson home and tour is located an hour north in Taos. 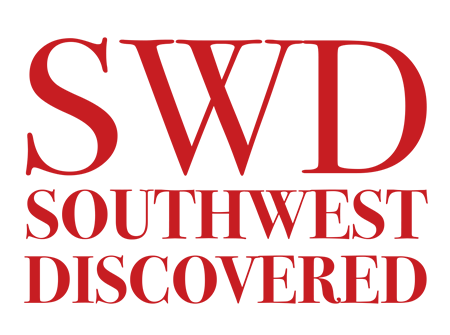 We will be covering both, as well as regional native museums and sites specific to their experiences with western expansion. Four miles from the Boone’s Lick State Historic Site. Head northeast on MO-187. Turn right onto MO-87. Turn left onto County Road 332. Then right on County Road 327. Continue onto County Road 336, then right onto MO-5 south. If you would like to read a realistic account of the trail before you begin your journey, to understand why forts came into play and know the story of how the west was actually won, we recommend Blood and Thunder by Hampton Sides. An epic story of western expansion — yes, so big it could wheel-chock an airplane. It is also a masterpiece detailing why America was in such a hurry to conquer California and the territories in between, how this was negotiated, fought for, and Sides holds nothing back while explaining the motivation of all peoples involved. It is a beautifully written, harshly realistic, intelligent page-turner. Next stop — the village of Arrow Rock. Ted: I was one of your social studies teachers at Center High School. I’d give you an A+ on this project. If you have time you’d make a presentation at one of our Native Sons and Daughters of Kansas Kansas City dinner meetings, Look up our website on Google. I vollunterr helping people research their genealogy on Friday mornings at the National Archives if you need help on your family history. Very impressive, the video really gets your attention and of course the aerial views make it more intriguing given the proximity to the river and on both sides as well. Good show. Doc, we knew we’d need to get in the air to really capture this area. Thanks for the comment! You are really setting the scene for us. Excited to know more about the history of the trail! Marcella, it is so much more than we imagined. Thanks for following us! Wow, this is fascinating. I had no idea about the Santa fe Trail, where is started and why. I can’t wait to follow you on this journey. June, thanks for traveling along with us. More history and video to come! I am inspired to take this trip in the spring and cannot wait to read about Arrow Rock. 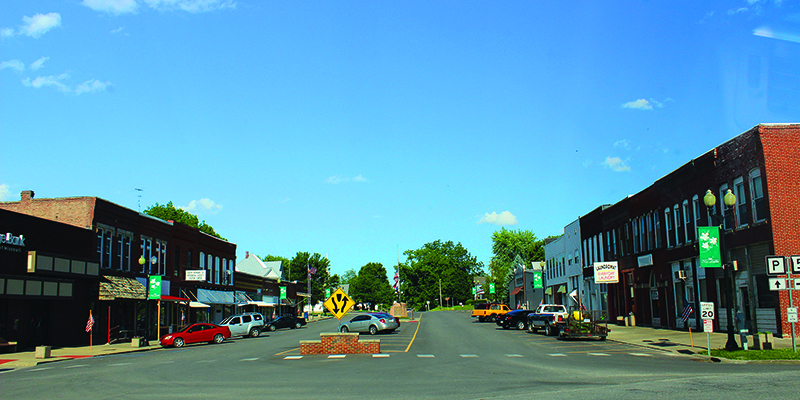 The entire town is registered as a historic site. Another town is Council Grove, Kansas. Will you be writing about it and if so I would like to know your recommendation on where to stay. Thank you! Phillip, Council Grove is on our Top 5 Must See Places on the trail. We recommend the Cottage House Hotel that was in business during trail days. While in Arrow Rock be sure to eat at the J. Huston Tavern, and take the tram tour of the town if it’s running. Reservations in advance are always a good idea, as these spots are very popular tourist destinations. This is wonderful coverage and a history lesson. I am curious as to why New Franklin and the flagpole area are not more of a destination with museums given the history there. Thank you for sharing all of this! I am enjoying this journey very much. Thank you for recommending the Blood and Thunder book and also I am loving the video moments!